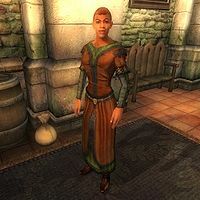 Angelie is a Redguard commoner living in the Imperial City's Talos Plaza District. She lives a recumbent and reserved life in the big city and never even leaves the District. She sleeps in her private quarters every night between 10pm and 6am and always starts the day with five hours of wandering on the ground floor. At 11am, she ventures outside and heads for The Foaming Flask for a two-hour lunch. She returns to her house at 1pm and spends another five hours on the ground floor before eating a two-hour dinner at 6pm. She gets up at 8pm, strolls around her house for a few more hours, before finally going to bed at 10pm. She wears a set of middle class attire, a russet felt outfit and doeskin shoes. She carries around a spare pair of burgundy linens, her house key, and a small amount of gold. Chat with her and you may discover that, unlike most Redguards, she actually uses a last name: Blakeley. She introduces herself using it, and talks about her father, "Angelie Blakeley. This is my father's house. He was lost at sea, many years ago. ", which provides enough information to deduce that her father was Grantham Blakeley. The full story of her father's fate can be learned if you pursue the stories surrounding the Forlorn Watchman near Bravil. Since a person's race in Tamriel is determined by the mother, Angelie inherited her mother's race, not Blakeley's Breton race. Her father's loss has had at least one effect on her life: "I'm content here. Some day I hope to meet the right man, but not a seaman. Never." This page was last modified on 3 August 2013, at 05:06.